NOTE: Water sets from Dugan, Imperial and Northwood are advertised in this ad, indicating that products in a single ad are not necessarily all from a single manufacturer. When supplies were low and sales had dwindled, combined ads were devised to reduce inventory. 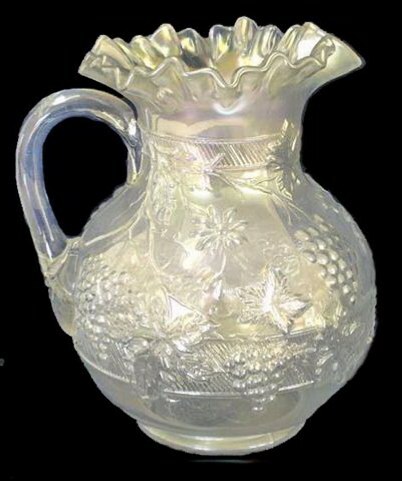 FLORAL & GRAPE Pitcher in White. FLORAL & GRAPE: Finding shards of this design in the Helman diggings confirmed that Dugan made the pattern to include the wide cable-like band which encircles the slanted ribs in the design. Fenton made a very similar pattern, with the main difference being that the ribs slant in the opposite way from those found on the Dugan pieces and of course, lack the described band. The Dugan pattern offers more floral and grape design than the Fenton versions and cover a larger surface area. on ~~ ~~ in our pattern alphabet on the homepage. These are quite scarce. the Tumblers are 4 in. tall. GRAPEVINE LATTICE: appeared in the Spring 1912 Butler Bros. catalog, continuing at intervals through the early 1920s. Marigold sets tend to be on the light side and are overlooked by collectors. Amethyst sets do not offer consistently colorful iridescence; tending to be on the silvery side, however scarce they are. Cobalt blue and white examples are quite scarce. 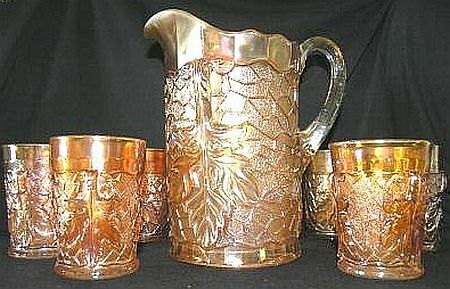 Pitchers are mold-blown with applied handle and somewhat on the delicate side. BEWARE: It should be noted that L.G. Wright reproduced the water set, small bowls and 7” plates in purple carnival. We have seen/handled them in the gift shop. 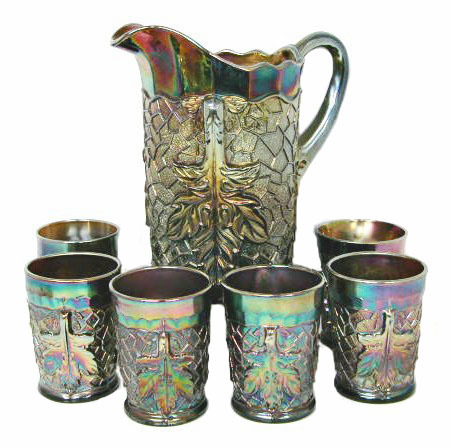 They have remarkably lovely iridescence and can well be mistaken for vintage examples. 1905 Opalescent era, prior to iridescent line. 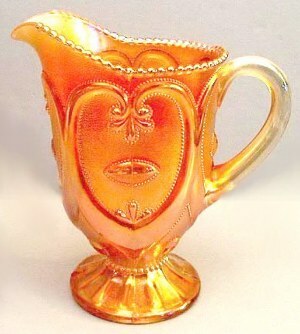 JEWELED HEART: From January 1905 through 1909, with “Victor” for a pattern name, this design was produced in various opalescent colors. 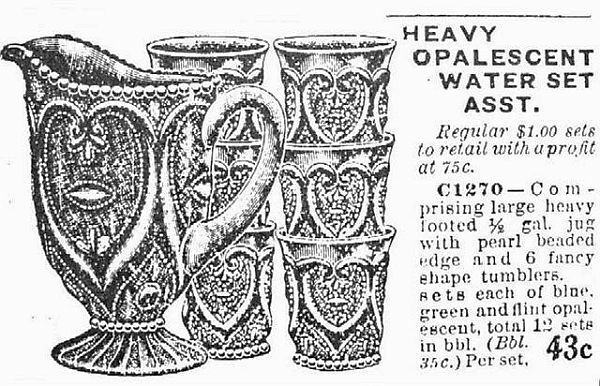 Carnival examples are limited, but peach opalescent Jeweled Heart pieces are seen in the Fall 1910 Butler Bros. wholesale catalog. 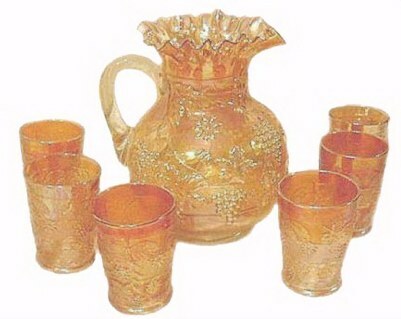 Pedestal footed pitchers are limited in carnival glass examples and this set is usually endowed with nice strong color. Viewing occasions are rare indeed, making it one of the more difficult Dugan sets to own. One white tumbler is know, but no matching pitcher has surfaced. Jeweled Heart is an exterior pattern for Farmyard bowls, Dugan's Cherry, Petal and Fan and Smooth Rays. MAPLE LEAF: Shards of this pattern turned up in the Helman diggings in the 1970s. 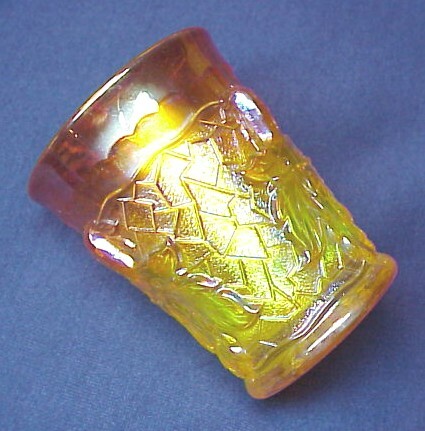 The fragments were of both carnival and custard glass. Results of those findings indicate Northwood to have produced a full line of custard during the 1890s. A water set, berry set, table set, cruet, jelly compote, toothpick holder and salt and pepper shakers were included. 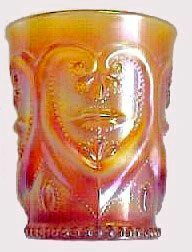 The carnival glass elements first appeared in late 1910 and were made by Dugan from molds used earlier by Northwood. 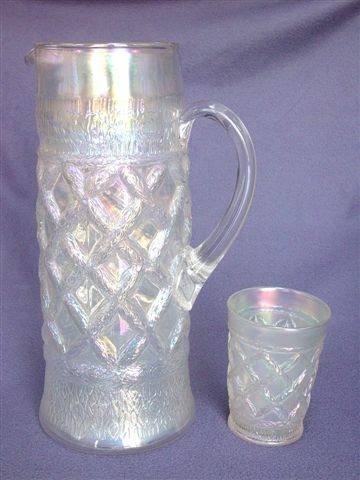 Diamond Glass continued limited production until late 1928. Water sets in marigold, amethyst, oxblood and cobalt blue, along with table sets and berry sets in those same colors are the extent known to be of vintage variety. One small bowl in green is known, as well. Dugan's gun metal iridescent finish is what we refer to as silvery in today's collector language. BEWARE: The water set was reproduced by L.G. Wright in amethyst, cobalt blue and ice green. 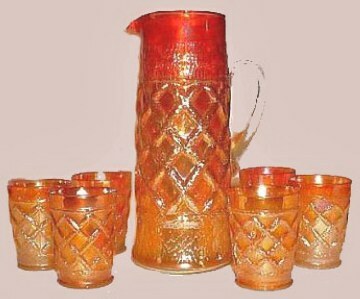 The Mosser trademark is seen on marigold tumblers. We cannot verify Mosser pitchers. 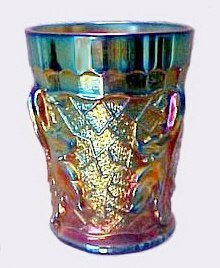 The amethyst Maple Leaf tumbler shown has the Hansen signature on the bottom. New table sets are known in amethyst and cobalt blue. 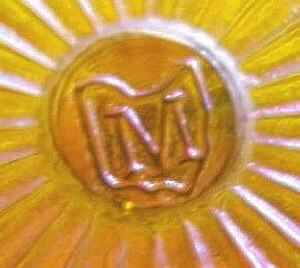 There are cobalt blue table sets marked with the letter “M” in the base, indicating some reproduction by Mosser. MAPLE LEAF - Mosser Repro. 4 in. high-Base signed. Script Signed Robert Hansen on base. Black Amethyst Maple Leaf. Teach your children godliness, faith, and uncommon love. Then, as they influence their world, they will reveal God to a new generation. Behold, children are a heritage from the Lord, the fruit of the womb is a reward. Like arrows in the hand of a warrior, so are the children of one's youth. Happy is the man who has his quiver full of them; they shall not be ashamed, but shall speak with their enemies in the gate.